This semester, the Contemporary Radical Jewish Thought student forum has taken on the project of re-imagining and re-configuring the annual Wesleyan Passover Seder into something we feel is more reflective of the things we have learned and experienced at Wesleyan. Part of this project involves collecting students’ thoughts on the phrase “Next Year in Jerusalem,” which is traditionally said at the end of the Seder. We want to know what this phrase means to you, particularly in the context of the conflict in Israel/Palestine. Whether it’s a sentence or a page or even a picture, we would love to see your ideas and include them in our new Hagaddah. Please send your thoughts to Ari Fishman ’13 at arfishman(at)wesleyan(dot)edu any time before break ends. Posted by Zach in Campus Life, Culture, Student Groups and tagged Contemporary Radical Jewish Thought, judaism, passover on March 20, 2010 at 5:18 PM. Hey! 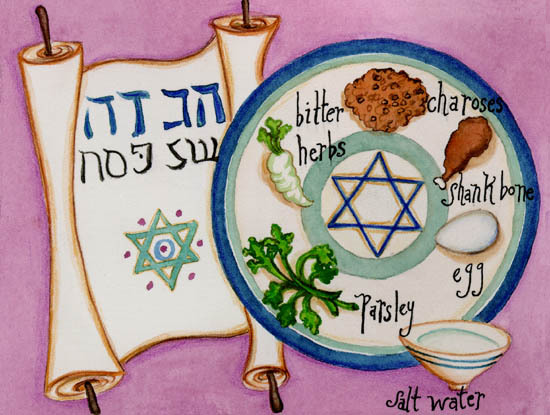 Your seder plate doesn’t have an orange on it! Seriously, having been to seders with the traditional, the child-friendly (pre-crayoned for each person), the Berkeley-style (vegan, with a toy lamb-noise-maker on the plate instead of a bone), the egalitarian, the women’s (see the orange, and bring your drums), the archaeologist’s . . . the more haggadot,the better. As WE were the ones led out of egypt, WE should connect to the book. Meanwhile, there remains the opportunity to argue over important traditions, like whether or not matzoh balls should be hard enough to bounce, and whether matzoh-brie gets salt or sugar. From the sound of the request, it doesn’t sound like they’re trying to revamp the entire Hagaddah. It sounds like they want to find a way to explore people’s thoughts and feelings on passover in a meaningful way, and that they want an addendum that might help some people enrich their passover experience. My experiences with the Wesleyan Jewish community in my four years here have generally been less than traditional, which is part of why I have felt able to explore my Judaism with the community. I believe that the student forum has been taught every two years for quite a while, and as such is part of what the Wesleyan Jewish community wants and needs. Tradition is beautiful, rich, and important, but not if you don’t engage with it and make it meaningful to you. Otherwise it’s just a dry book. that’s what we get for allowing the CONTEMPORARY RADICAL Jewish Thought student forum to touch the haggadah. whoever let them get their hands on it wasn’t thinking. agreed with comment #1.
stupid. once in a while there is something to be said for tradition.